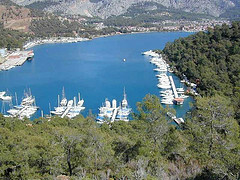 129 available yachts at this destination! What makes Turkey even more appealing is that it is the bridge between two continents, therefore boasting the perfect harmony between oriental and modern as well as splendor and sleekness making Turkey a land of diversity. Every visitor coming to this spectacular destination will find something for themselves, be it world-class cuisine,vibrant cities or historical monuments. Turkey’s rich cultural heritage and an unsurpassed beauty make it a truly glamorous luxury charter destination which will leave you under its spell long after you step off board from your luxury charter mega yacht. Istanbul, one of the principal Turkish ports of call built over seven hills is home to the prestigious Kalamis Marina, a perfect centralized location for mooring your luxury yacht. With an impressive past that dates back thousands of years,Istanbul was the capital city of three monolithic empires, Roman, Byzantine and Ottoman, and is to this day the country’s largest city, port as well as business and cultural center. 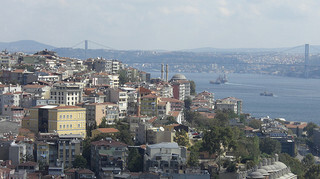 The city is divided by the Bosphorus Channel, the waterway separating Europe from Asia. Embarking on your luxury sailing yacht or luxury mega yacht in Istanbul is equivalent to an enticing adventure in this one of a kind port with rich history and culture waiting for you on every step of the way. This thrilling city has it all and visitors will be far from disinterested as they stroll through the historic alleys and passages. You will be delighted to dine at one of the seafood restaurants endemic to this port or visiting a typical bustling Turkish café for an afternoon specialty coffee or tea. Your visit to Istanbul will not be complete without a stroll through the historical Grand Bazaar, one of the largest covered markets in the world, where you will be able to try your skills at bargaining with local merchants as you pick and choose your souvenirs or a typical Turkish snack. This place is not solely noteworthy for handmade furniture, carpets, leather goods or gold jewelry but also for its unique and picturesque architecture. Cannakale is a city located on Turkey’s northwestern coast at the Dardanelles and, along with Istanbul, it is a town of two continents. Home to beautiful beaches and quaint villages, a big draw of this destination is its awe-inspiring architecture, representing thousands of years of history and some of the ancient world's best-known cultures. Moreover, Canakkale is the nearest major town to the ancient site of Troy and the city’s fortress offers panoramic views opening up to the marvelous waters of both the Mediterranean and the Black Seas. It is therefore the perfect playground for your luxury charter yacht to swiftly glide through the translucent waters of the two seas. Further down south on the Aegean Coast is the picturesque seaside town of Ayvalik boasting a magnificent coastline and many enchanting coves. This historical and archeological point of interest which has undergone many changes throughout the years is known for its large olive groves and its history of olive production encompassing such products as olive oil but also olive soaps and delicious foods. Magnificent beaches lure all enthusiasts of fun in the sun affording a prime opportunity to snorkel in the turquoise waters and explore therich marine life. 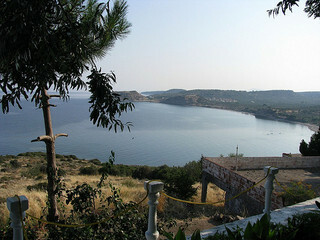 After a glorious morning on the beach, opt for a relaxing afternoon stroll through the historic city center where many cafes and restaurants offer such Turkish specialties as Aryan, a healthy beverage prepared from diluted yogurt that hydrates and provides essential minerals needed especially in the hot summer months. Spend the evening aboard your luxury charter mega yacht, sit back on the deck with a fresh cocktail in your hand and enjoy the magnificent views of the setting sun leaving the sky in shades of warm yellow, orange and red. Kusadasi, one of the most important historical centers of the region, is with a doubt worth the detour during your luxury charter vacation. 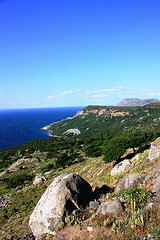 Boasting some of Turkey’s most unique and important sites, this charming port of call is not known uniquely for its magnificent sandy beaches but also for breathtaking architecture and its proximity to Ephesus, Miletos, Priene and the Greek island Samos. Learn the history and observe the intricate details that go into constructing the world-renowned hand-woven Turkish rugsor listen in to the myth of Virgin Mary’s house where the “healing water” spring was found. As your luxury charter yacht glides swiftly through the Aegean Sea, you will arrive to Bodrum, an exhilarating seaport in the region. The charming Milta Bodrum Marina conveniently located in the heart of Bodrum has all the amenities for your luxury yacht. Overlooking the harbor is the Castle of St. Peter built by the crusaders in the 15th century from where breathtaking views of the region enchant visitors again and again. 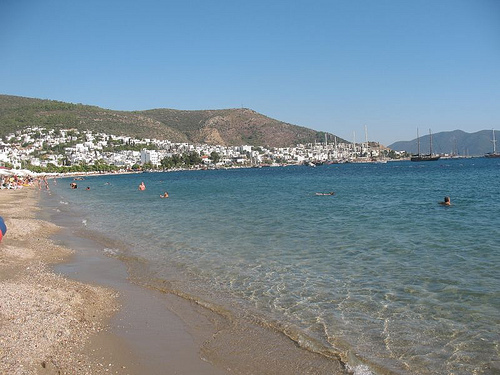 Bodrum is not only a bustling market town but also a vibrant entertainment center with marvelous restaurants, cafes, discos and night clubs for everyone to enjoy. So whether you opt for a quiet evening on board of your luxury charter vessel or a night full of entertainment in the city center, Bodrum has it all. The city is also a splendid location for all divers and fishermen who wish to complete their list of dream destinations with one more name.Furthermore, they should also visit the Museum of Underwater Archeology within the Bodrum Castle. The city is also the location of one of the ancient Seven Wonders of the World, The Mausoleum, and it houses a wonderful amphitheatre overlooking the picturesque town and harbor. Bodrum is surrounded by scenic anchorages where you will be able to moor your luxury charter mega yacht or luxury charter catamaran for the day as you step off board to enjoy immaculate powdery beaches and verdant Mediterranean flora before returning to the marina at night. Start yet another day in paradise with a delicious Turkish breakfast of olives, tomatoes, salads, cheeses and jams served in the sun on the deck of your luxury charter yacht. As your yacht glides calmly through the soothing waters of the Aegean Sea and nears the seaside town of Alacati, a panorama of modern windmills will stretch before your eyes. Around 70 kilometers away from the bustling coastal city of Izmir, Alacati is home to a hilltop wind farm with promising views and one of the most daring ports of call for all yachting enthusiasts. Favorable weather conditions as well as a wave-less and sandy-bottom bay beguile windsurfers from all over the region to take advantage of the transparent blue waters. However, if you are not a water sports fan you will thrill at the thought of the colorful cobblestone narrow streets lined with old stone houses, cafes, restaurants, shops and hotels where you will be able to soak in the Anatolian culture to the fullest. As you sail your luxury charter boat further to the south along the Turkish Riviera, you will reach the quaint resort town of Marmaris where luxury yachts are comfortably docked at the SeturNetselMarmaris Marina. The now widely renowned seaside resort was less than 20 years ago just a small fishing village which now enchants visitors with a true vacation ambiance. The town’s old center sports bustling bazaars and restaurants specializing in local delicacies and is an equally enjoyable place to visit during the day as it is at night. Different bars and night clubs in Marmaris catering to various tastes promise unforgettable evenings marked by fantastic food, lively music and dancing. 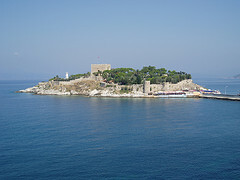 Marmaris is an exciting port of call thanks to its proximity to some of the most wonderful coves and islands in the region, the most popular destinations being, among others, the Star Island-Nimara and the Phosphorus Cave, where you will spend a truly adventurous day snorkeling, diving, swimming, beachcombing or lounging in the sun. Outside of Marmaris you will also find two caves, SomalikayaDudeni and Sucikti, that are well-worth visiting due to their impressive depth and length and the presence of lakes inside them. Gocek is a small Mediterranean town luring visitors with deep shades of greens and blues and rocky mountains. 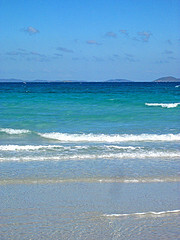 This beautiful surrounding will leave you overwhelmed with over 11 nautical miles of bays and sandy beaches. With a long season starting in May through to November, the town is especially appealing to everyone looking for an adventure in the sun. The bays azure waters are the perfect background for your luxury charter yacht offering options to moor in one of the town’s six upscale marinas. 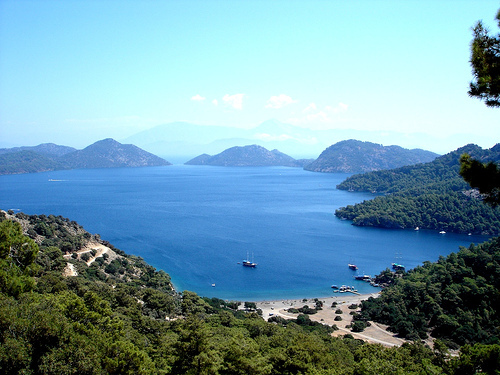 From powdery beaches to quaint bays to many cultural sites, Gocek has everything it takes for a vacation of a lifetime! Sunreef Yachts Charter offers exciting charter vacations in Turkey, a truly impeccable region sporting azure blue skies, turquoise waters and powdery white beaches. A country with a rich cultural history,Turkey is divided between two continents offering the best of both Europe and Asia. Both modernand traditional, dazzling and refined, this eastern Mediterranean charter destination offers a wealth of enticement that will keep you coming back for more!